The Cavalry is here, in glorious Funko Pop! Form. It's about time someone other than Coulson got the toy treatment, but let's be real: When the hell are we going to get an actual Melinda May action figure? Instead of griping about what this toy is (more on that later), let's enjoy what it is first: Little Agent May! Even in cutesy Funko Pop form, she totally looks like she's judging you. Or about to smash your face into a table. Either or. 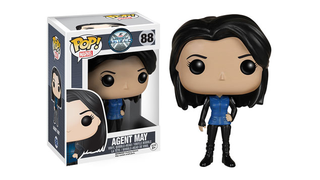 There's been an AoS-branded Coulson Funko pop out for a long while, so it's nice to see the show get a little more love, especially as it's Agent May. Who doesn't want more Agent May in their lives? But this does make me wonder... how on earth is there not an Agents of SHIELD box set of the team? Hell Marvel, you like money. How are there not two packs pairing them off, or 6" Marvel Legends sold individually except for a build-a-figure Simmons that means you have to buy every figure just to get her? It's kind of strange that they can be so on-the-ball about merchandising the movie heroes — hell, the Ant-Man figure was revealed within days of seeing the first trailer — there seems to be very little toy goodness for Marvel's TV ones. Coulson's only got a figure because he's been paired with Fury and Hill as a movie set. It's kind of a shame. But for now, if you want your very own little Ming-Na Wen you'll have to take your Funko Pop! May and like it. The Pop! Vinyl Agent May is coming out in May. Because of course it is.